While Zakat Foundation of America (ZF) is known for its relief projects across the globe, ZF is also very much active in the Chicagoland area. 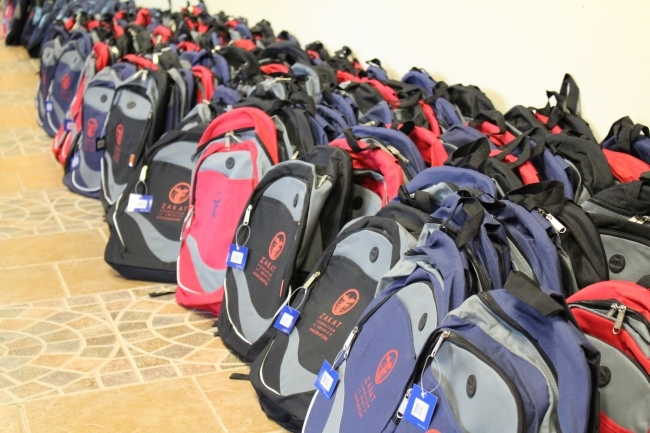 This past week, ZF partnered with local community organizations to distribute backpacks to families in need right before the school year starts. The distribution took place at the tenth annual Back-To-School rally for the 5th and 6th Municipal Districts at Setnes Park in the Hazel Crest neighborhood. The event was organized by the Juvenile Division of the Circuit Court of Cook County. Almost 200 families gathered alongside prominent community leaders such as Judge Donna L. Cooper (6th Municipal), Judge Richard F. Walsh (5th Municipal), and Judge Michael W. Stuttley (Ret. – 6th Municipal). As the event was coming to an end, ZF team members helped distribute backpacks filled with school supplies to families in need. Many families in these communities cannot necessarily afford to purchase new backpacks or supplies every year. The summer BBQ cookout was complemented with a live DJ and games for everyone to enjoy. The annual rally and cookout is an opportunity to send young people to school on the first day with the necessary tools for a successful year. ZF wishes to continue its partnership with local community organizations to make sure we are not only combating poverty across the world, but also in our own backyards. With the support of Allah (swt) and generous donors, ZF will remain committed to these initiatives and is grateful to be able to help local communities in their pursuit of empowering their youth.